A Slice of Smith Life: 7 Quick Takes: Pope Pictures, Confirmation, Our Blessed Mother's Birthday, Tea Time, 9/11, and Etc. 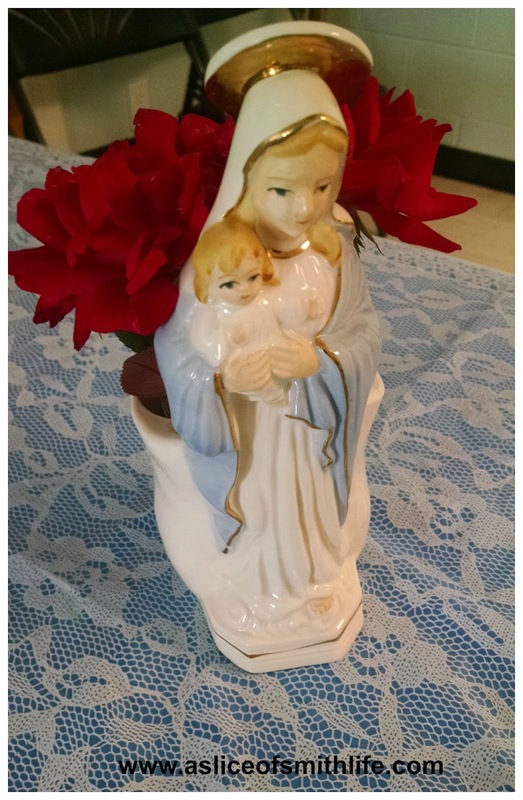 7 Quick Takes: Pope Pictures, Confirmation, Our Blessed Mother's Birthday, Tea Time, 9/11, and Etc. 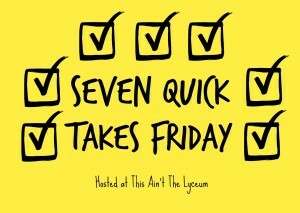 It's another Friday which means another opportunity to link up to 7 Quick Takes hosted by Kelly at This Ain't the Lyceum. Here is this week's edition. 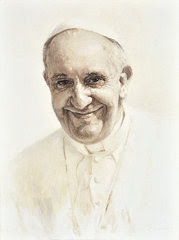 And I have to show you this painting of Pope Francis by my artist friend, Cameron Smith! This is his latest masterpiece! Isn't it amazing and beautiful? Cameron is so talented! Be sure to check out his website and the different size prints available for purchase just in time for our Pope's visit to the United States in a few weeks! 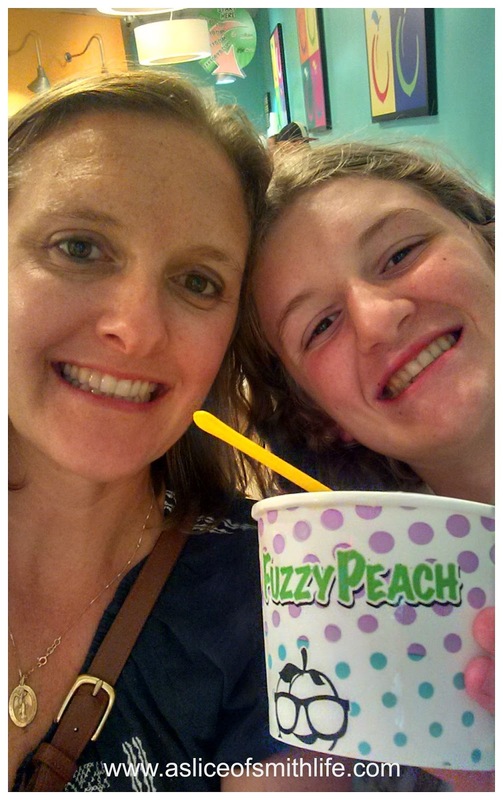 This is a photo we took at a yummy yogurt shop that we visited this past week after my daughter and I went to her Confirmation rehearsal. 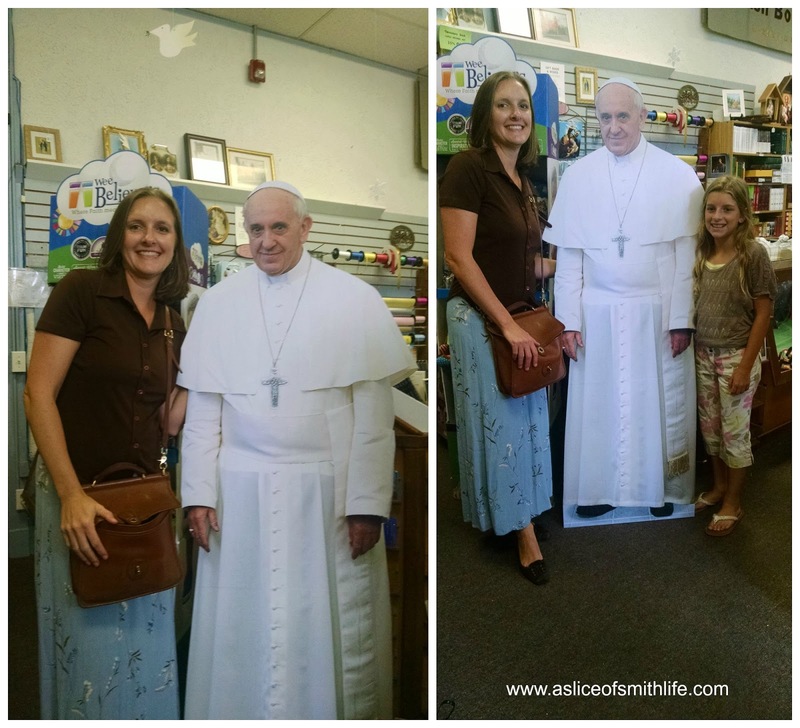 My oldest daughter will receive the sacrament of Confirmation this Saturday, Sept. 12 at our parish. What an exciting weekend it will be! What is Confirmation? Confirmation is a true sacrament instituted by Christ and different from baptism. It is administered by laying-on of hands and anointing with chrism accompanied by prayer. The chrism is blessed by the bishop and the bishop administers the sacrament. 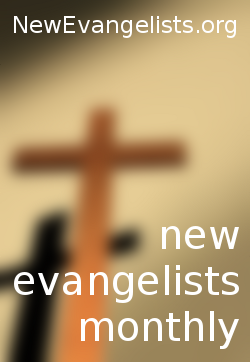 All baptized persons can and should be confirmed. 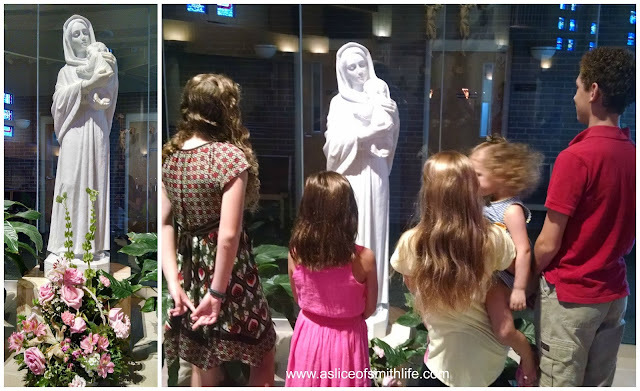 The effect of the sacrament of confirmation is to give strength in faith and for the confession of faith and to impress an indelible character. 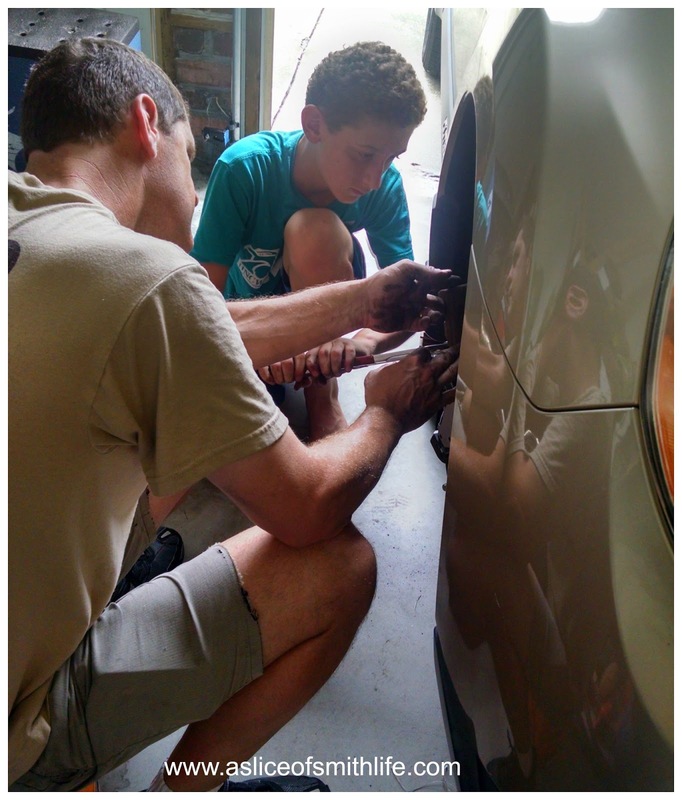 These two gentlemen make my heart happy. I like to call this photo "Studious Sisters". :) I snapped this photo this week as I was putting my youngest down for her afternoon nap. 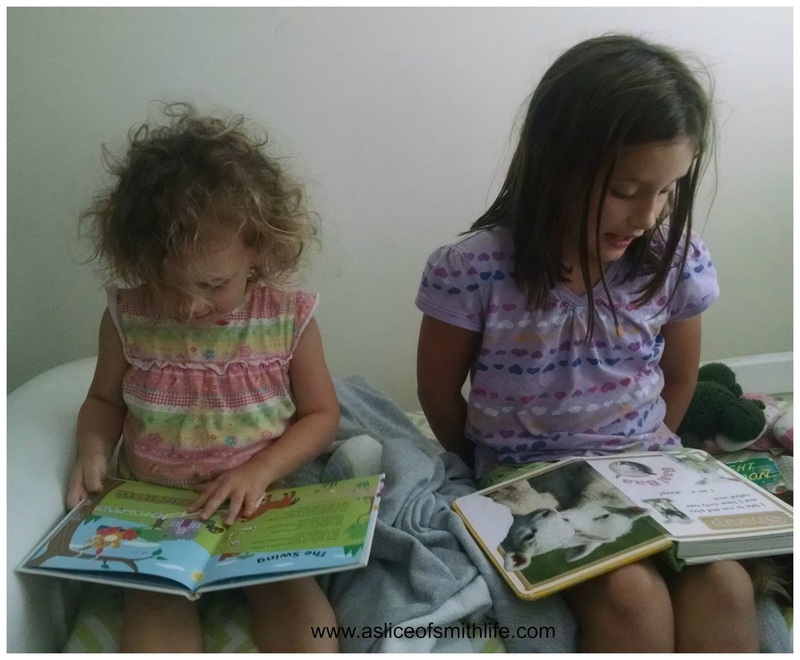 My 7 year old was reading to my 2 year old as my 2 year was "reading" like her big sister. We had our first "Tea Time" over 7 years ago when I was pregnant with Baby #4. My goal is to have Tea Time each week where we read the upcoming Sunday's readings and discuss them. 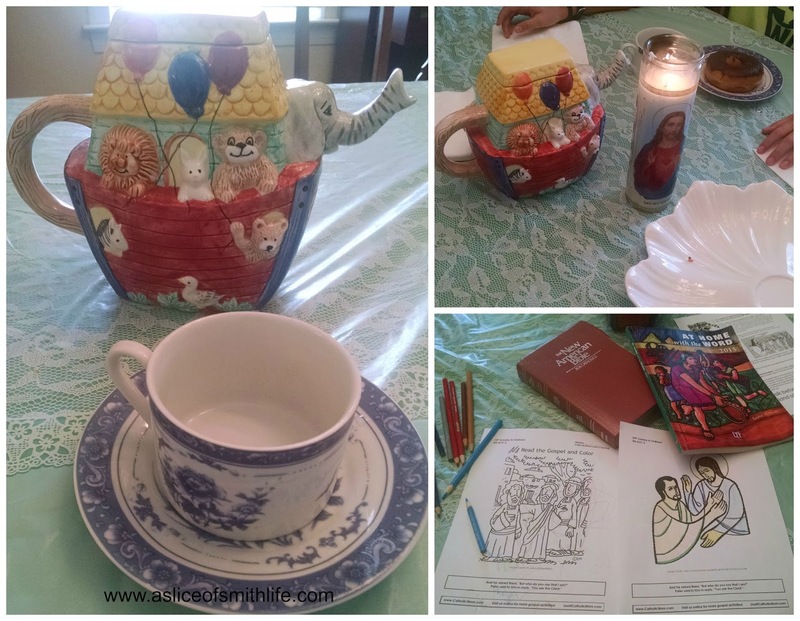 We have a special treat, drink from our tea cups in the dining room, light a candle and set the table with the liturgical color of the season (now green for Ordinary time) While the Scriptures are being read, my kids eat and some color pages from CatholicMom.com that go with the Gospel reading. 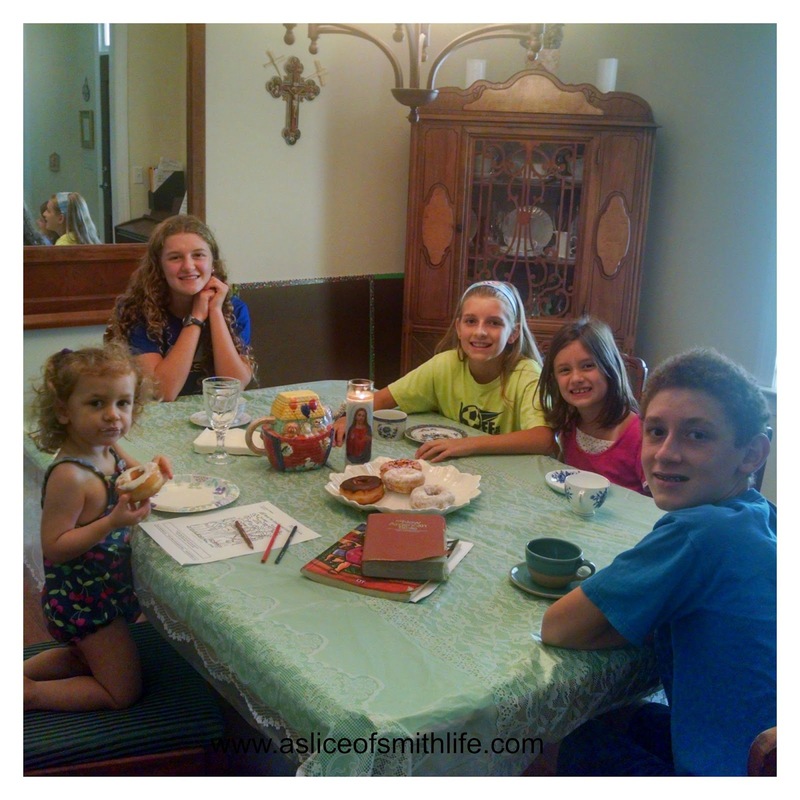 We haven't had Tea Time consistently because of life, but my kids have been asking for this special time each week for awhile so today was the first Tea Time for the 2015-2016 school year. 14 years ago today...I remember so many details of that day as so many do. 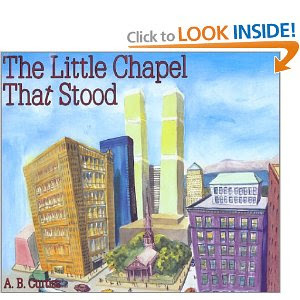 I plan to read the book The Little Chapel That Stood, to my children today after we attend morning Mass to pray for all those who died and for the family and friends they left behind. Reading this book has become our annual tradition to remember 9.11. It is a beautifully written and illustrated book that I highly recommend for anyone with young children. 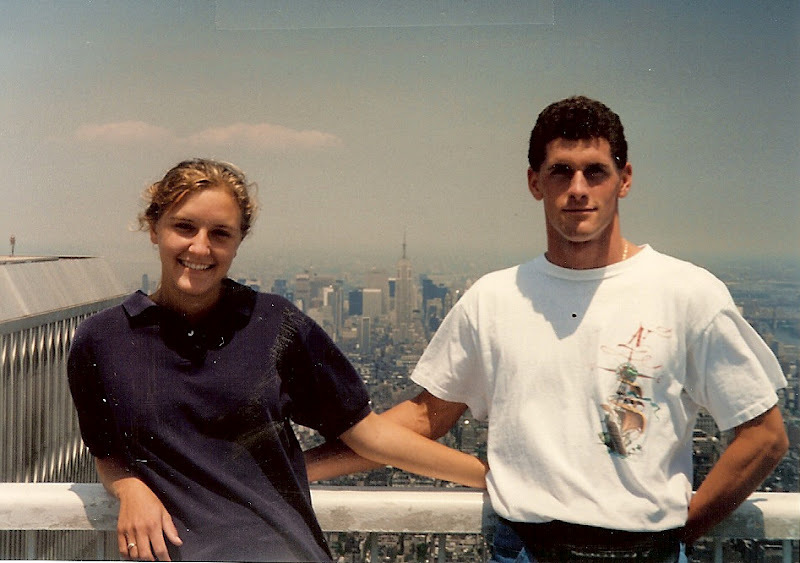 Who knew that 8 years later on 9.11.01 these pictures would give me such a strange and sad feeling?? And that many years later I would be showing these photos to my children with such a heavy heart? 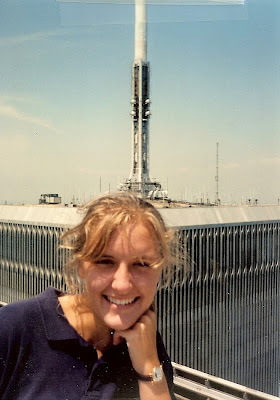 What a wonderful post---so many great things you guys are up to...and I love those pics of you and Anthony at the Twin Towers. 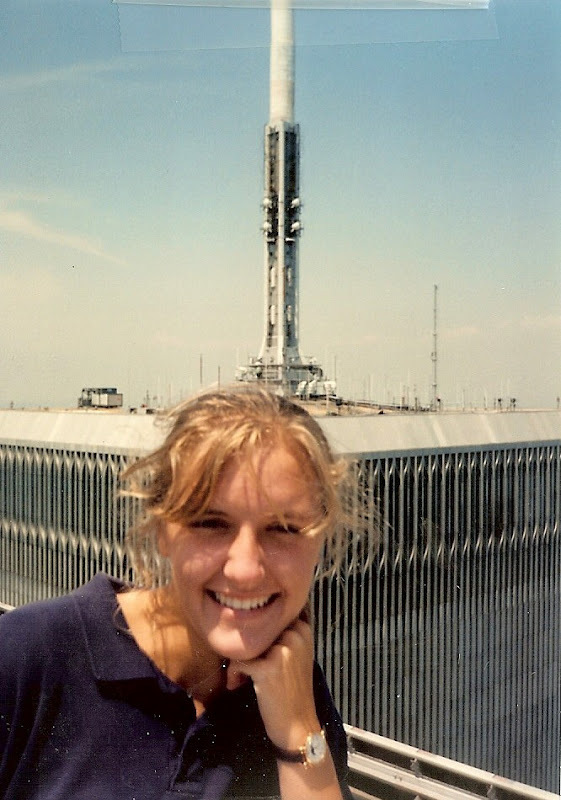 All those times we were in or near the Battery or saw the towers in the distance driving on the Grand Central Parkway on my to/ from work and I never snapped a shot. Those are amazing. Congratulations on your daughter's confirmation! We'll be thinking of you tomorrow for the big day! can't wait to hear all about it! 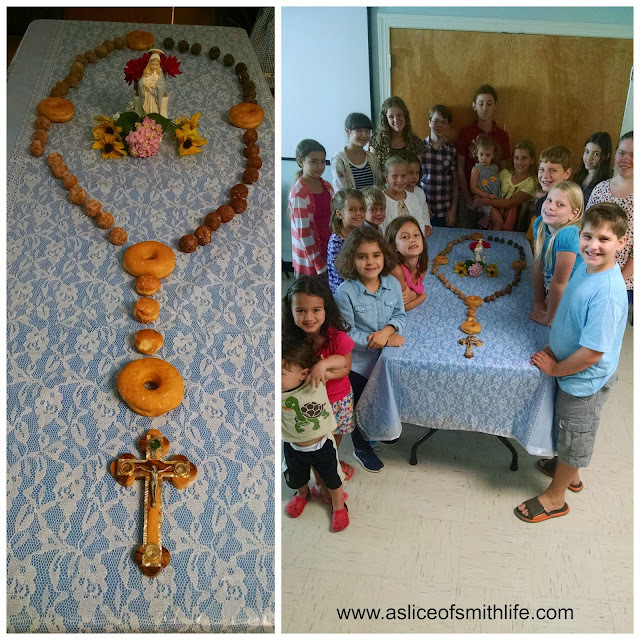 That donut rosary looks yummy; what a cute idea. You have so much going on! Congratulations to your daughter on receiving her Sacrament of Confirmation! Thank you Chris! I had forgotten about the TT pics until I found them after 9-11. As soon as I saw them I got a chill up my spine and now each time I look at them, I still feel sad and strange. Thank you for the Confirmation congrats! It was a beautiful day! Thank you RAnn! Have a blessed week! Thank you Patty! 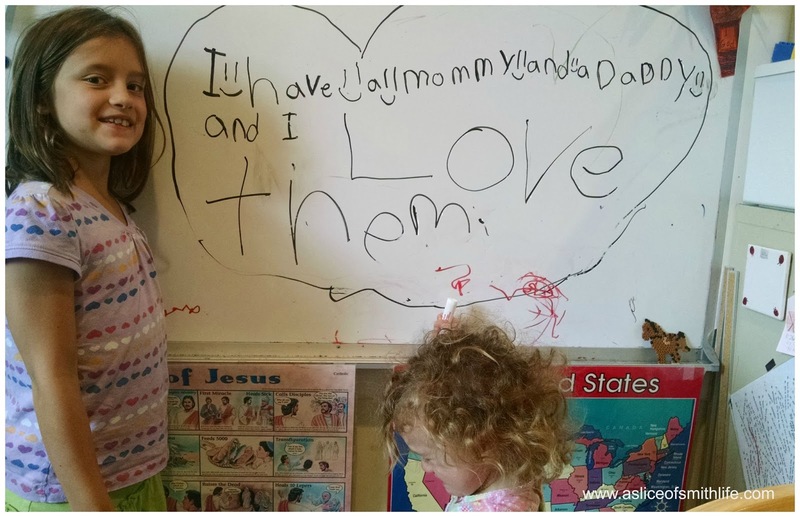 It was a beautiful sacramental celebration!